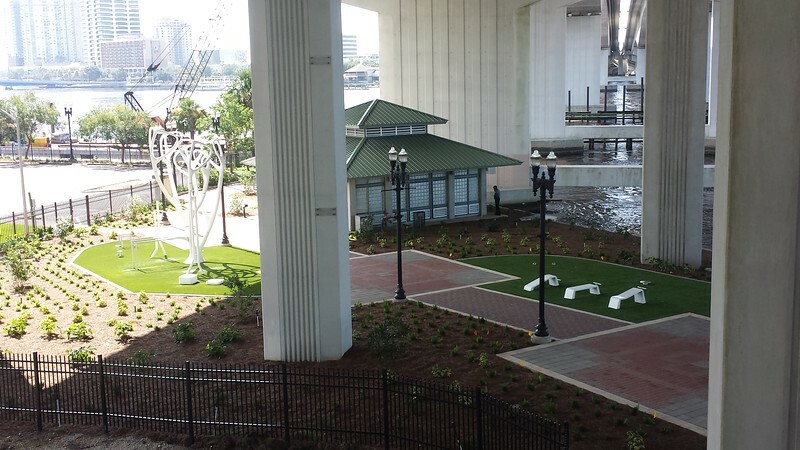 The City of Jacksonville has opened the newest addition to the Northbank Riverwalk. 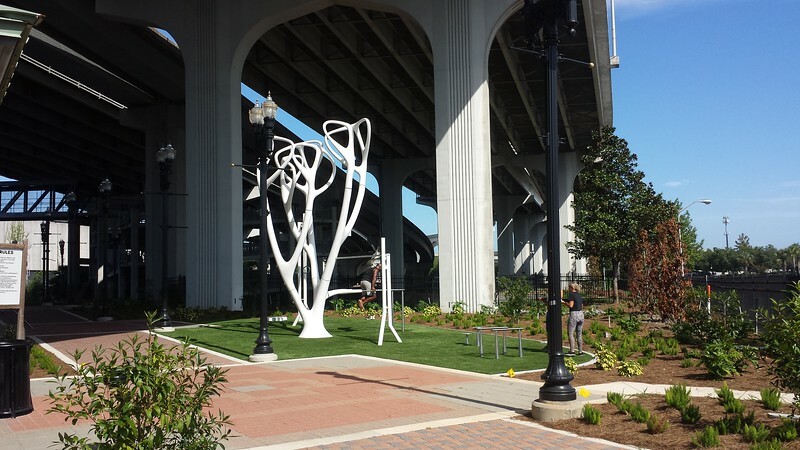 Corkscrew Park, located underneath the the Acosta Bridge along the Northbank Riverwalk, recently received an upgrade that included the addition of public art and exercise equipment. 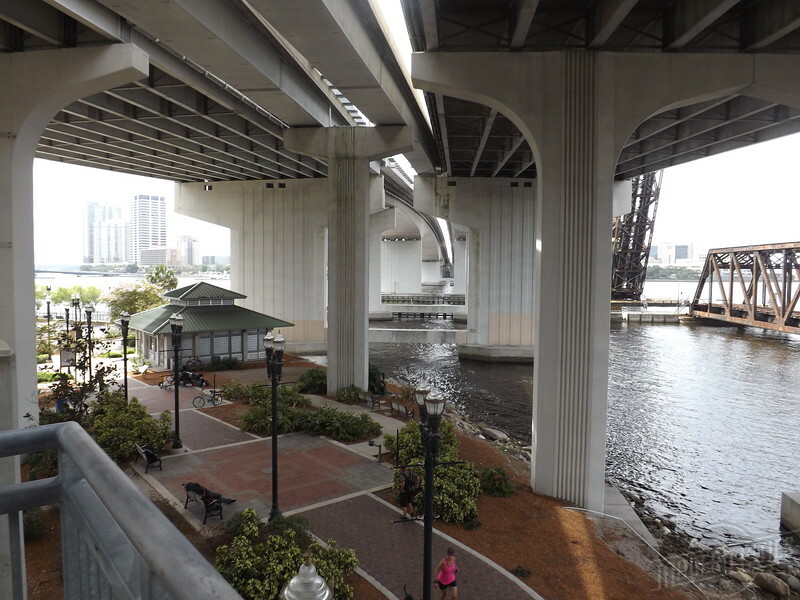 Runners, joggers, walkers and bicyclists now have a free amenity for exercising along Downtown’s waterfront- aided by the shade provided by the Acosta Bridge which rises overhead. 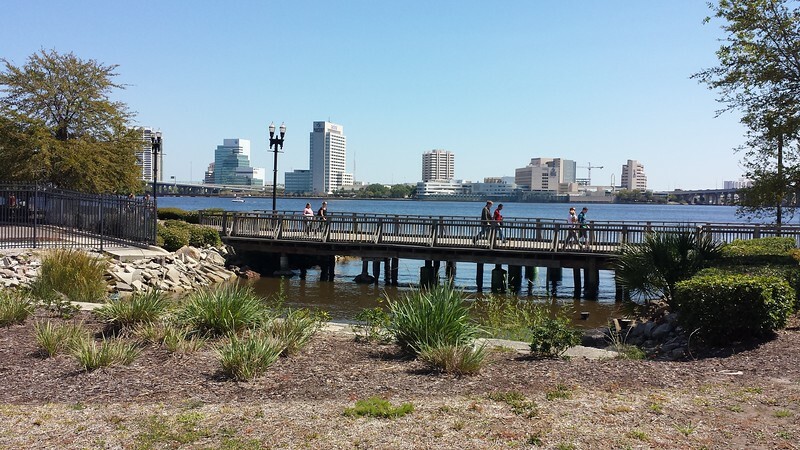 The 2-mile Northbank Riverwalk is one of the most popular and well-used attractions in Downtown Jacksonville. 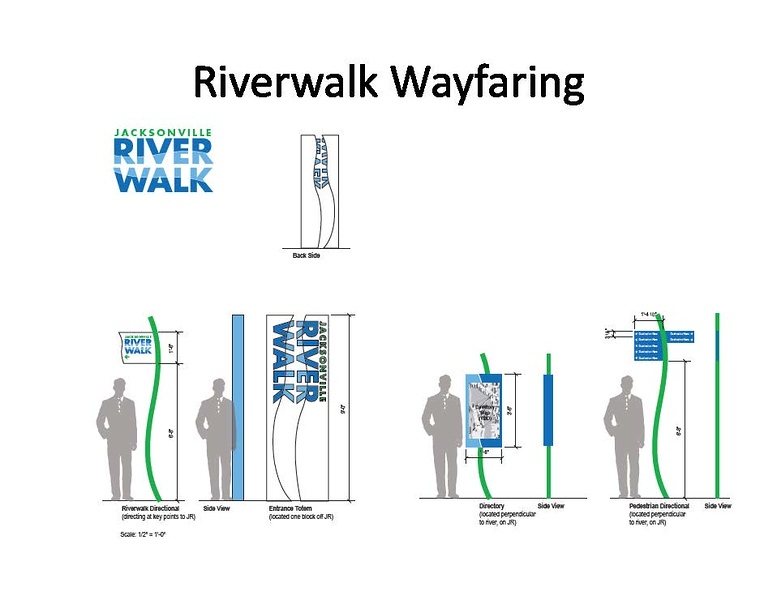 Developed incrementally between 1987 and 2008 for a total estimated investment of $8.5 million, the riverwalk stretches two miles from I-95 in Riverside to Berkman Plaza near the Sports District. The Northbank Riverwalk was expanded from Pearl Street to Interstate 95 in 2005. 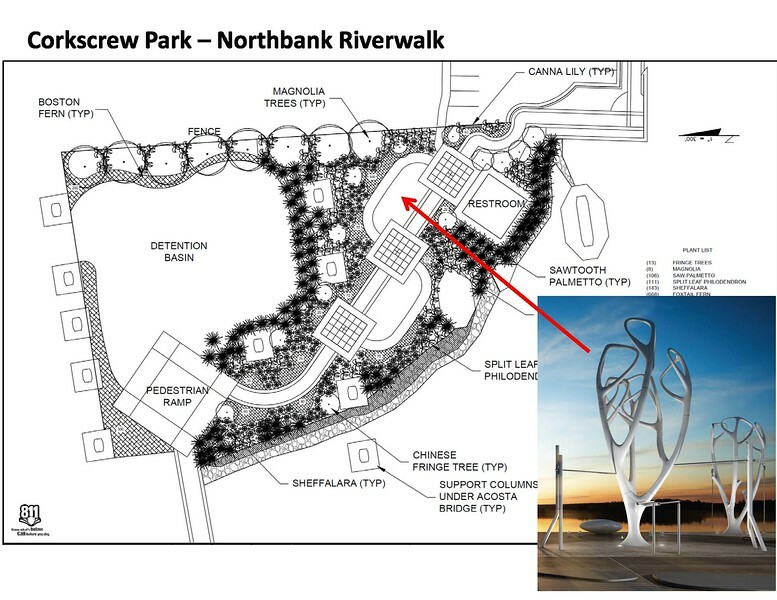 The $6.2 million extension provided a pedestrian, waterfront connection to Downtown’s Norhbank with the Brooklyn and Riverside neighborhoods. This extension was funded by the Better Jacksonville Plan and included a pedestrian overpass over the Florida East Coast (FEC) Railroad. The property located to the East of that pedestrian overpass and adjacent to the CSX corporate headquarters, is now referred to as Corkscrew Park. The exercise equipment, public art and shoreline stabilization was funded by the City of Jacksonville’s Department of Parks, Recreation and Community Services at a cost of $206,000. The restroom facilities located on site originally constructed in 2008, but which had been closed to the public for some years, are now fully functional and accessible during normal park hours. Parks Department staff along with Downtown Vision ambassadors monitor the area to develop data on park usage, act as a resource to Riverwalk uses and to maintain cleanliness and upkeep. In 2018, the Parks Department also contracted out to a private security firm to provide an armed security presence that patrols the Northbank Riverwalk seven days a week. This new security detail costs $128,000 annually. 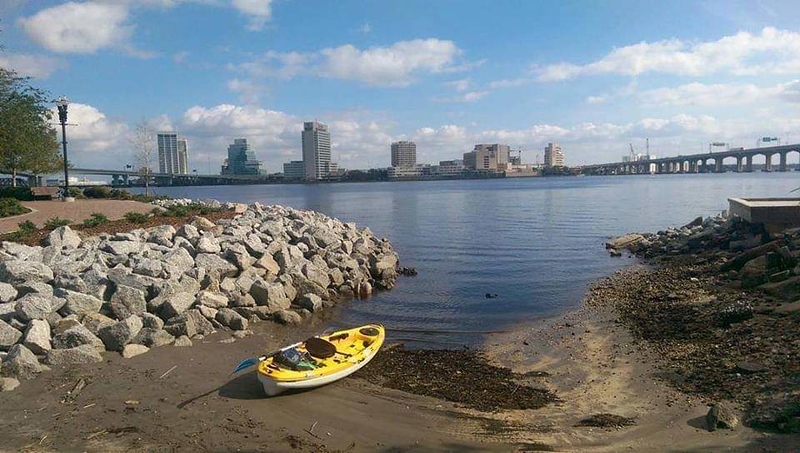 The Corkscrew Park enhancements are part of a larger initiative that includes upgrading public access points and creating active nodes of activities along Jacksonville’s urban waterways. Earlier this year, improvements were completed at Sidney Gefen Park along the Northbank Riverwalk in the Brooklyn neighborhood to replace an aging, wooden footbridge. 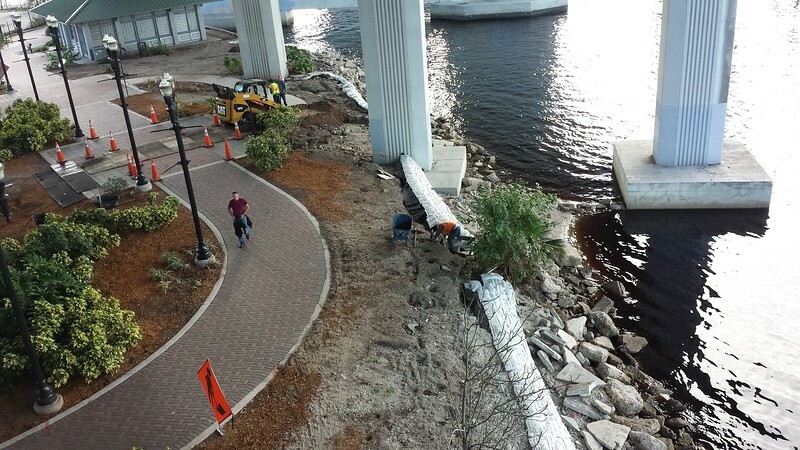 The $218,100 project removed the wooden structure and re-routed the Riverwalk along a shoreline path. 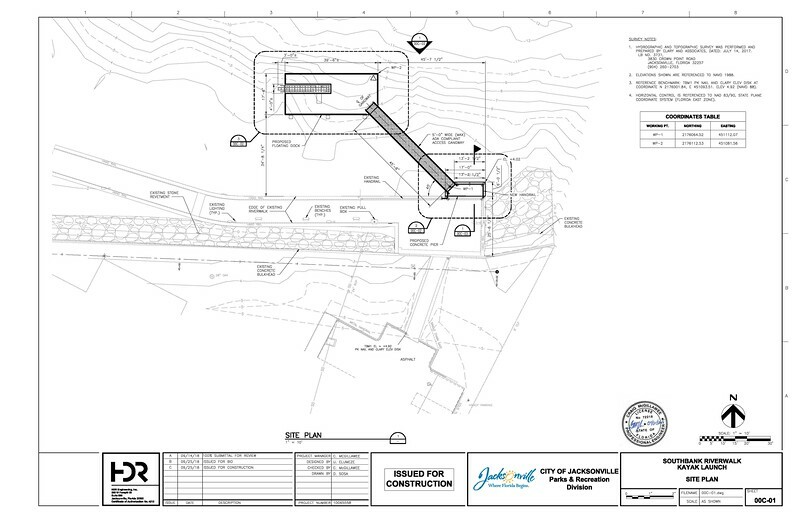 This new pathway allowed for the installation of a handicap-accessible kayak launch. $71,400 of the overall project cost was paid for with grant funds from the Florida Inland Navigation District (FIND), a program that develops waterway access and improvement projects throughout Florida. AFTER: Sidney Gefen Park in 2018. Image: Jonathan Addington. Sidney Josef “Sid” Gefen (1920-2015) was a tourism and civic booster in Jacksonville. He founded a company called International Productions, which staged large international trade shows for the tourism industry. Before Gefen’s passing, he wanted to install the tallest Ferris wheel in the country at the park that now bears his name. Instead of a ferris wheel, the park serves as a much-needed access point for eco-tourism related activities. 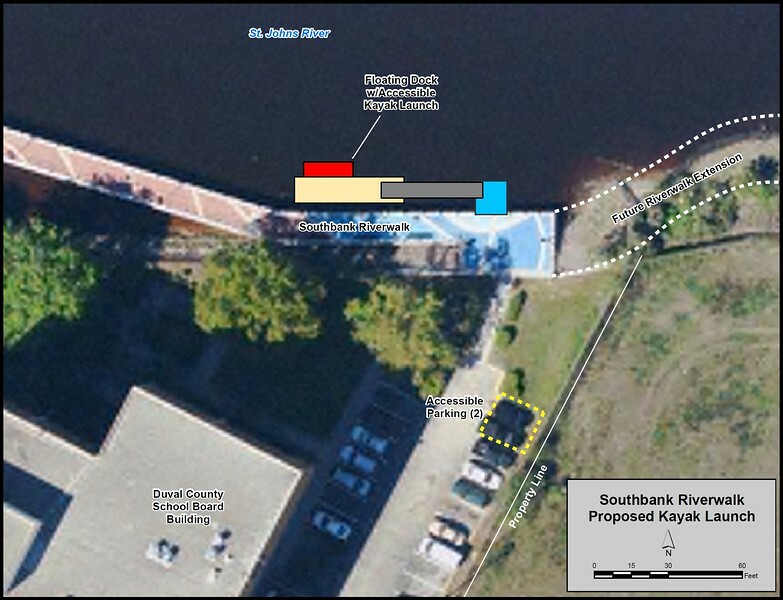 The next urban waterway enhancement will commence with the construction of a floating dock and kayak launch along the Southbank Riverwalk and adjacent to the Duval County School Board building.